One of the first images that caught my eye as I entered the exhibition space was this curiously coloured image towards the centre of the Milky Way. Its title is ‘Colour Field’(Katie Paterson, 2016). The artist had first removed all colour information – which had presumably been derived from combining original astronomical images recorded through specific colour-band filters – and then added back colour derived from a Los Angeles cityscape. In this one image we have a clear statement of the fact that we, and our cities, are all made from the atoms of our host galaxy. Way back in January 2013 a colleague and I were chatting with the head of Turner Contemporary’s Learning team when the conversation veered off at the sort of angle that sometimes leads to serendipity. We were engaged in an experiment to bring together scientists and artist to discuss an up-coming retrospective exhibition of sculptures by Carl André (here). Although there was a slew of interesting outcomes – including invitations to take part in future interdisciplinary projects with Turner Contemporary – one tangible output from this engaging exercise was the brief animation available here. This ‘side road’ within our conversation concerned a proposal to send a ‘meteorite’ into space. The artist, we were told, was seeking funding and facilities from the European Space Agency in order to send a chunk of re-caste meteoritic material back into space “in a celebration of science, art and human technology”. The artist in question was of course Katie Paterson – and her proposal to ESA resulted in a fist-sized chunk of meteorite being ferried to the International Space Station in May 2014. 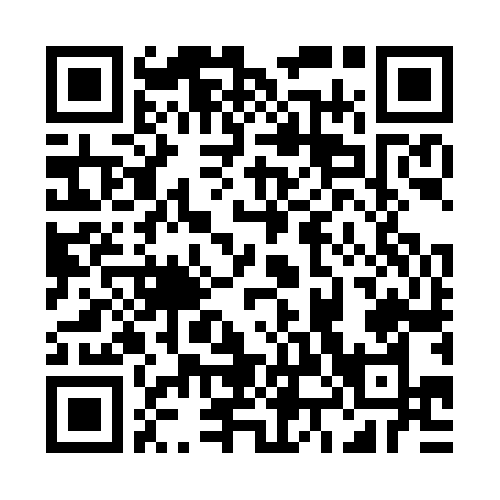 The ESA web site has a write-up here. I would have loved to have been involved in some way, but a chemical physicist/materials scientist like me could never have provided the sort of expertise she needed. Having now seen the exhibition of her work, including the piece associated with her ‘meteorite’ proposal, I am doubly disappointed because I suspect I’d have learned a lot from collaboration with her. (I was, it must be said, up to my neck in my ‘day job’ as an academic at the time so, in truth, it would have been a difficult project to fit in.) Thus, a fascinating conversation and follow-up email evaporated away … until the doors opened to this exhibition. The obvious exhibit to focus on in this context is ‘Campo del Cielo, Field of the Sky’ since that derives from her work with metallic meteoritic material. My photo of the piece (taken with permission, please note) is shown below. This piece derives, apparently, the largest of a set of five iron-based meteorites; it was the smallest meteorite that was used for the trip back into space aboard an unmanned supply shuttle to the International Space Station. The original meteorites were approximately 4.5 billion years old – as one might expect given that this is the age of the solar system and thus the bodies within it. 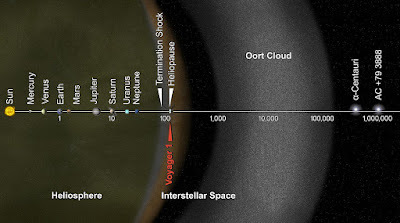 In passing, the recent missions to comets and asteroids relate to bodies which are of comparable age; unlike the other rocky planetary bodies we’ve explored ‘up close’ – Earth, Moon, Mars, Venus – these smaller wanderers remain largely unchanged since the solar system was formed. Hence the scientific value of missions such as NASA's Stardust (here) and Japan’s Hayabusa (here) which were designed to collect pristine material and return it to Earth, and the expectations associated with the next generation of missions already underway. Katie Paterson’s idea, which is what I heard about way back in 2013, was to take a cast of these iron-based meteorites and then re-melt them into their casts. We therefore have a remnant from the early period of the solar system’s existence which has travelled to Earth and thereafter been transformed by the artist’s conscious intention into a version of itself before being sent back into space, albeit in near-Earth orbit. Campo del Cielo, Field of the Sky by Katie Paterson (2012-14). Iron-based meteorites do in fact contain other metals, such as nickel (both metals are amongst my favoured elements – see here) and may well have minerals within them as well. They are mostly the remnants of ancient asteroids, the more volatile parts having melted away to leave only the densest material as a residual core. 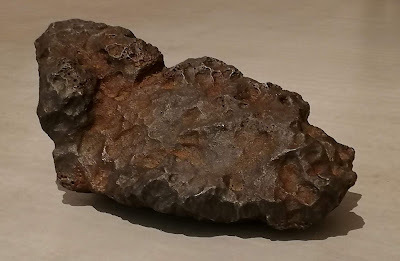 For an overview of these and other types of meteorites I recommend the Natural History Museum’s website, here. Melting an iron-based material requires a furnace capable to reaching temperatures in excess of 1538ºC; I’ve done it, using a home-made furnace during my PhD in the mid-70s; it’s not easy. Three other pieces amongst a host of thought-provoking items in the exhibition particularly excited my inner scientist: two by Katie Paterson herself and a cabinet of work by Mary Somerville and Caroline Herschel. The two contemporary pieces used sound and light to encourage a novel look at our relationship to the Sun and to the Moon. ‘Totality’ fills an otherwise gently-lit room with bright reflections from a rather special rotating mirror ball, illuminated by a couple of spotlights. Walking slowly through the moving 3-D pattern of reflections was quite disorienting – a fact which serves merely to pique my interest. Key to the piece is that the ‘mirrors’ on the ball are derived from images of solar eclipses, originally recorded over a span of time from the present day back through early nineteenth century photography to drawings made centuries ago. Using headphones, supplied by the ever-friendly gallery staff, one may augment the experience by listening to one of two audio pieces created by the artist to complement the piece. Then there’s the automated Steinway grand piano which sits – or perhaps that should be plays – at the heart of ‘Earth-Moon-Earth’, which is installed in the same room as the Totality mirror ball. The concept of piece is ostensibly fairly straightforward: Beethoven’s Moonlight Sonata was turned into Morse code (- a process I would have liked to have had more information on) which was transmitted to the Moon. The reflected signal was turned back into a musical score and output via the piano. The surface of the Moon is such that the signal is altered on its return. Whole notes are missing, sometimes several in a row, and this creates an intriguing pseudo-new sonata in which the pause becomes integral to the whole. As a probe of the Moon’s cratered and mountainous surface, this artwork provides one of the most novel methods I’ve come across. Totality, by Katie Paterson (2016). Earth-Moon-Earth (Moonlight Sonata Reflected from the Surface of the Moon), by Katie Paterson (2007). 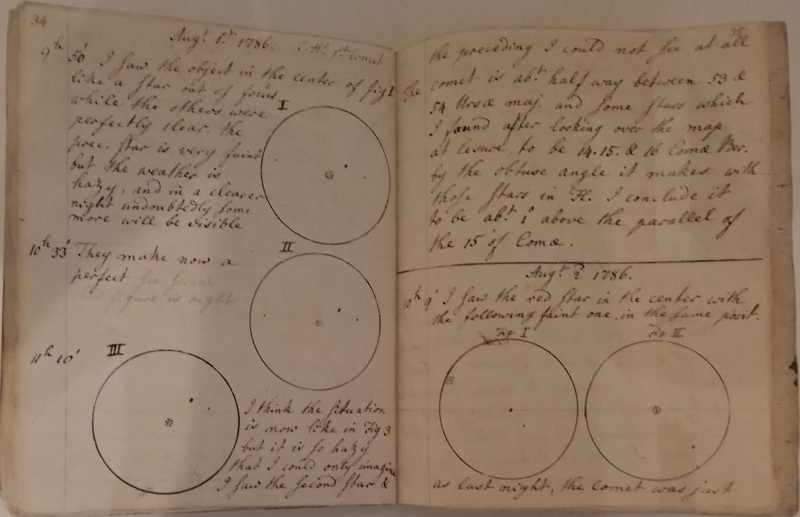 Finally, I couldn’t help but mention a cabinet containing a few opened books containing the original notes of observations made by the astronomer Caroline Herschel. 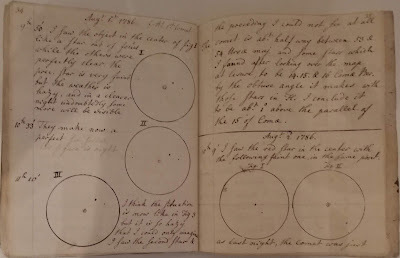 These include the page shown below on which she records discovering her first comet (1st August 1786), and a corresponding letter to the secretary of The Royal Society containing the news. Alongside these sat examples of the enormous number of numerical calculations she undertook – published, it is sad to note, in her brother’s name because of The Royal Society’s rules as they were at the time. She was a contemporary of the talented mathematician Mary Somerville, some of whose work is also shown. Who says art and science can’t communicate! Personally, much of the creative writing I’ve delved into since ‘retiring’ remains informed by my experiences as a scientist: like so many others, I write out of who I am, often to make sense of my own thoughts. Coincidentally, a longer piece I started a couple of months ago, currently set aside for a season, includes an astronomer looking back to the Earth from the Moon. She stands bathed in Earthshine. What’s so special about the Earth? I set myself a challenge earlier in the year: to put together a talk for our local branch of the U3A (see here for details) highlighting some of the combination of factors which foster the life that abounds on our planet. What is it, from the perspective of a physical scientist, which helps to make this ‘third rock from the Sun’ into a jewel? Meeting this goal turned out to require significantly more time and thought than I had bargained for. It’s a topic that has intrigued me since taking an optional course in geophysics whilst I was an undergraduate Physics student in the early ‘70s. However, getting stuck back into some reading – actually, quite a lot of reading – and trying to craft an equation-free talk which would encapsulate some key areas for a group of intelligent non-specialists needed all my creative ‘muscles’. Hindsight assures me that this was no bad thing as I learned a lot in the process. What’s that old saying? ‘If you want to understand something better, teach it’, or words to that effect. So true. After introducing myself, and making it clear that this was not an area of particular expertise – not itself an issue within the U3A framework since it’s designed to foster a form of community learning – we took a look at where we are. Starting at the scale of the Milky Way, our home galaxy amongst the billions of others to have formed since the Big Bang, we zoomed in to the Solar system. Not that ‘zooming in’ seems entirely sensible in this context, but it does help to set the scale of things. Having established where we are and the approximate size of things, the next obvious question relates to how the Earth and other planets came into being. I’ve touched on this in an earlier post (click here) so I won’t needlessly take up space by repeating it. There is, however, a piece of news hot-off-the-press which does need to be added to this earlier account. 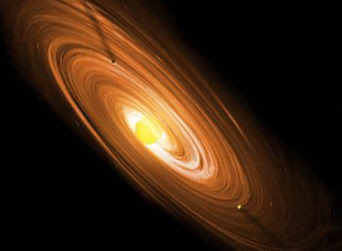 On 2nd July – so a few days before this post was drafted in support of my U3A talk, the European Southern Observatory issued a press release (available here) outlining the first confirmed direct observation of a planet in formation around a dwarf star. Our Solar System is only 4½ Gy (billion years) old, which makes it quite young in the context of the time since the Big Bang (13.8 Gy). The lyric from the 1960s musical ‘Hair’ becomes apt at this point: “we are stardust, we are golden”. The point being that there have been multiple generations of stars before the Sun, many of which exploded towards the end of their lives as supernova and in the process created all the heavier elements of the periodic table. These new types of atoms were blown out across space, eventually to be incorporated into planetary systems around later generations of stars. New stars are still being formed within the Milky Way. The Sun, which represents 99.9% of all the mass in the Solar system, is a ‘middle-aged main sequence’ star which means that it’s been stable for about 4 Gy – lots of time for life to develop. It resides in what we might term a ‘quiet suburb’ of our galaxy; we have no black holes or analogous threats in our neighbourhood, which is good. Our nearest neighbour galaxy, Andromeda (M31 in the formal catalogues) is actually heading towards the Milky Way at over 400,000 km/h – but because it’s 2½ million lightyears away we still have several billion years before it arrives. The Earth is a rocky planet with a molten core, travelling in a near-circular orbit around the Sun with an average radius of 150 million km; one complete orbit takes 365¼ days. All of which tells us that, given the energy output of the Sun, we’re at just the right distance for there to be liquid water at the planet’s surface – if there’s any water present that is. This relatively narrow band of distances from a star is often referred to as ‘The Goldilocks Zone’; Venus and Mars, our nearest neighbour planets exist right at the inner and outer fringes of the zone respectively. Moreover, whilst a highly elliptical orbit might take us repeatedly in and out of the zone, our near-circular orbit keeps the Earth within it all the year round. If the Sun were to be cooler than it is – and there are plenty such stars out there – the Goldilocks (or ‘Habitable’) Zone would have a smaller radius. Planets close to their star tend to have very short ‘years’ and are often locked into having a single face pointing towards the star (- much like the Moon with respect to the Earth: we only ever see one face). This means that half the planet’s surface would be warm and the other half cold – even if there was an atmosphere, the weather patterns would be quite unlike our own and one might even see any water present condense on the cold side. 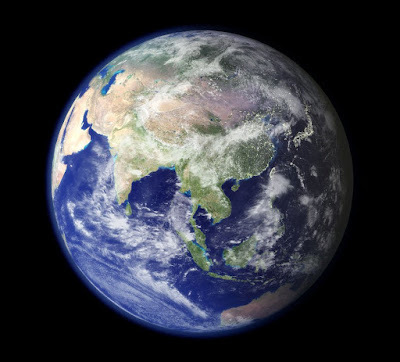 The Earth has a radius of 6,378 km at the equator and mass 6 x 10²¹ metric tonnes (6000 billion billion). This tells us immediately that it has the sort of density that allows such phenomena as tectonic plate movement to occur. Venus, for example, also has tectonic plates, but their density is such that subduction apparently does not take place; this is the process whereby one plate ‘dives’ down below another as they drift towards each other, generating life-giving volcanic activity for instance. Tectonic plates form a crust on the Earth’s surface and move because we they float on a molten core beneath. This fact implies that the Earth’s temperature, beneath its surface layers, must be high enough to create and maintain the molten magma. Some of this heat energy derives from when the Earth was formed out of the violent impacts between dust, asteroids and comets – there hasn’t been time for it to have radiated away into space yet – but at least half of the heat energy comes from continuing radioactive decays. Which fact takes us right back to the benefits of being formed relatively late in the life of the universe such that all these usually heavy radioactive elements, like uranium, had already been created and spread by earlier generations of stars exploding as supernova. 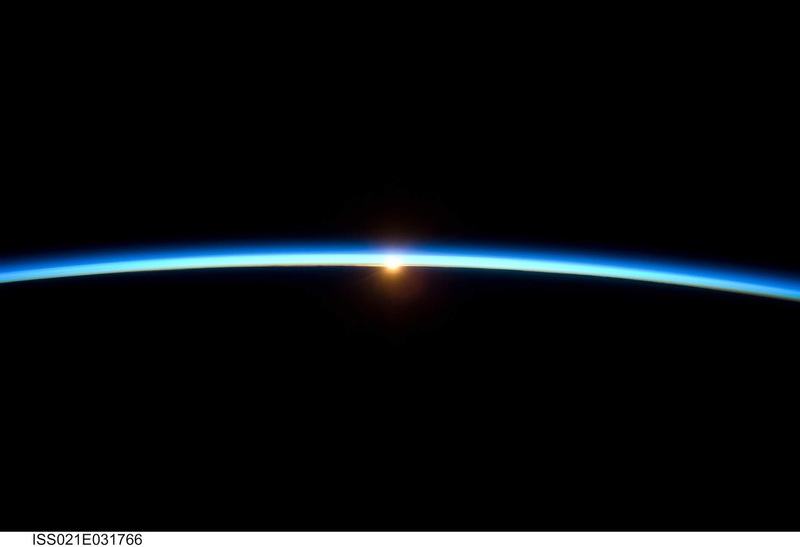 The Earth’s mass is high enough for us to hang on to an atmosphere, unlike Mars which has lost much of its atmosphere. Our atmosphere is very thin, and it’s fragile, but it’s there – and tectonic plate movements help to regulate its makeup of gases as well as helping to regulate the planet’s near-surface temperature. 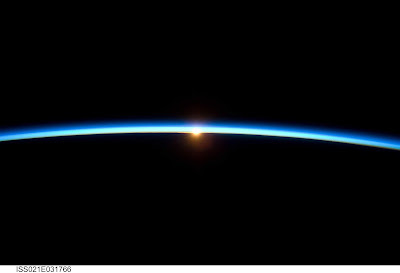 This stunning image of the sunrise viewed from the International Space Station was taken by Canadian astronaut Chris Hadfield – it reveals the thin shell of our precious atmosphere covering the curve of the Earth. The Moon is the fifth largest moon in the Solar System, and by far the most massive moon in proportion to its planet. Indeed, the Moon’s mass is a full 1.2% of the Earth’s. This might not sound a lot, but consider the solar system’s larger moons: they orbit planets that have far, far higher masses than the Earth. For example, Titan has more than three times the mass of the Moon but that still represents only 0.04% of the mass of its planet, Saturn. Thus, we have a moon that exerts a strong effect on our oceans, creating the tides. There is a more subtle element to our relationship with the Moon however: it is massive enough to stabilise the angle of tilt of our rotation. In other words, it stops us from ‘wobbling’ too much, thereby granting us long-term stability in terms for our climate’s seasons. The Earth spins at an angle of 23.5º. That’s what gives us our solstices and our beneficial seasons as any given region of the Earth’s surface will tilt towards or away from the Sun as its orbit (the year) progresses. This is a ‘middling’ value – Mercury’s is 0.03º whilst Uranus’ tilt is at 82.2º. However, more important for the emergence and sustainability of life is the fact that it doesn’t vary much. Compare this to Mars’ tilt, which shifts between 10º and 60º in timescales of a mere million years or so and thereby alters its climate fairly rapidly. It takes a proportionately big moon to be able to stabilise the tilt of its host planet in this way. There’s another consequence of the Moon’s large mass relative to the Earth which may well have an impact on tectonic plate movement. We naively think of the Moon orbiting the Earth in the same way as the Earth orbits the Sun, and in a sense it does. However, the physics of the situation tells us that whenever two bodies are tethered together – in this case via a gravitational force – they will rotate around their mutual centre-of-mass. In other words, both the Moon and the Earth rotate around this centre-of-mass, and it’s the centre-of-mass that orbits the Sun. I have tried to illustrate this in the simple diagram shown below. The fact that the Moon is massive enough to pull the Earth to and fro during each of the 28 days of the lunar month, albeit by a small amount, may well be important in terms of plate tectonics. 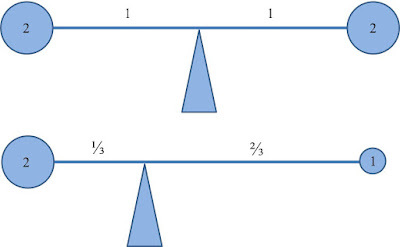 An equal mass at either end of our beam means that the centre-of-mass – the balance point – must be in the middle of the rod connecting them. However, if one of the masses is only half the other then the balance point shifts towards the more massive end; the position of the centre-of-mass shifts along the rod in proportion to the masses. Now, the Earth is 81 times as massive as the Moon so, for the Earth-Moon system the centre-of-mass is actually within the Earth: about 1700 km beneath the surface in fact. This animation may help you to visualise what’s going on. Thus, whilst there are undoubtedly many millions of planets even in our own galaxy, there are several important things that need to be in place before any of them could truly be called ‘Earth 2’. We inhabit an amazing planet that has nurtured life. It behoves us to treat it accordingly. Although drafted in the week prior to delivering my talk, I delayed publishing this post until afterwards ... just in case. It is for others to tell me whether I succeeded in conveying my passion as a non-expert scientist for this topic, but I must record my appreciation for the participants. There were some cogent and challenging questions posed throughout - the answers to some of which lay outside the bounds of my amateur understanding - and several genuinely helpful contributions. I got to 'talk science' and I came away having learnt something - I think that's called 'win-win'! This opinion piece in the Guardian newspaper (here, published several days after my talk and after this post was uploaded) perhaps adds fuel to the debate on whether we are 'alone' in the universe or not. You may have heard of the Drake Equation, which set out to quantify estimates for intelligent life existing other than on the Earth and concluded that there is likely to be many examples, even in our Milky Way. Enrico Fermi, a hugely important person in the annals of 20th century physics, articulated a paradox (e.g. see here): if there are so many civilisations out there why is it that we've seen precisely none? The Guardian's opinion piece reflects on this. When I first conceived this blog, more than fifty posts ago, I set myself a limited number of goals. In essence, my aim was to try to encapsulate a lifelong love for the sciences by reflecting on some of the things that I do and experiences I have had in its pursuit; thereby, or so I hoped, others might be drawn by my passions. There was a self-centred motivation as well: I enjoy the process of writing; it helps me sort out my thoughts and make a little more sense of who I am and what I am doing. Were I not writing for myself, at least in part, it is doubtful that the blog would have continued for very long. Given that I am no longer paid as a full-time professional scientist, having ‘retired’ from my former post as Professor of Materials Physics a couple of years ago, my contact with ‘things scientific’ has changed. There is some reflection of this in the previous post, here. However, this new vantage point has brought something into focus that relates to my blog’s original objectives but which I haven’t considered in a direct fashion hitherto*. My posts have, by design, omitted swathes of day-to-day life – even when events within it had a direct impact on being a scientist. That phrase, ‘being a scientist’, is at the core of the blog’s raison d’être but the emphasis has never rested on the word ‘being’. Thus, in this particular post I have decided, albeit in a generic rather than an overtly personal sense, to offer a reflection on that which links ‘being a scientist’ into the warp and weft of humanity. The point of all this is to lay claim to the fact that a scientist isn’t particularly ‘special’ in a qualitative sense. Were I a sporting person, a bricklayer, a nurse, a priest or a farmer I might therefore also write an analogous post on this theme – but I’m none of those things: I happen to have enjoyed a career in science. Scientists are neither sub-human nor super-human. This might seem self-evident; it should be self-evident. However, I have met and/or witnessed enough examples of scientists being stereotyped towards one end or the other of an imagined spectrum to know that bias, unconscious or otherwise, is far from uncommon. In truth, bias is endemic. We all suffer from it in multiple ways: it’s important to realise that it’s present since awareness can be an important form of mitigation against its effects. So, Doctor Who or Doctor Strangelove: shall we adopt a caricature? We so easily slip into stereotypes, but Juliet and Shylock both offer a better approach. I value and enjoy my ‘life scientific’, I always have, but I’m neither an evil genius nor a hero. I have been ecstatic at new birth and felled by bereavement, I suffer the same sorts of physical and mental illnesses as others; I love, enjoy, dislike and hate; I succeed and I screw up; I have insight and I’m in a fog; I disbelieve and I have faith; … just like you. It was about four years ago that I began to taper, flexibly. What has been surprising in certain respects is the nature and duration of the taper, with a corresponding joy emerging from the serendipity of the new. In this post I try to reflect upon the transition from full-time academic scientist into a ‘freelance’ scientist who is developing other interests, and the extent to which echoes from the former are still being enjoyed. For very positive personal reasons, and after a cluster of re-alignments in research activity (e.g. here) and sensing a reduced scope for further innovations in teaching (e.g. here) I decided to become my university’s ‘guinea pig’ within a new scheme for ‘flexible retirement’. It worked well in terms of re-balancing my week and seemed a sensible initial step towards an eventual retirement in the more conventional sense of the term. Thus, for approximately 18 months I drew a fraction of my university salary and a complementary fraction of my pension. The eventual decision to retire from my post completely arose fairly organically from this interim stage. However, the final step brought with it at least one surprise – on the day of the retirement celebration planned by friends within my department. Catering had been organised, invitations sent out and I had begun to steel myself for the necessarily emotional aspects of the event. However, a police-issued order for a lock-down intervened: someone had called them with a (hoax) bomb threat. So no catering, and half my university friends/colleagues were locked in their own buildings; even my wife was stuck at a road block and unable to enter the campus. A kind soul remembered that there were some crisps (potato chips for those in the USA) and peanuts left over from a student reception the previous day, and the residual tea/coffee was augmented by the generous gift of a few bottles of wine which happened to be in the Head-of-Department’s office. I made a few impromptu remarks – my remarks tend to be impromptu – about how life is made of relationships, and that it would be the people I would miss the most: which I meant, and still do. 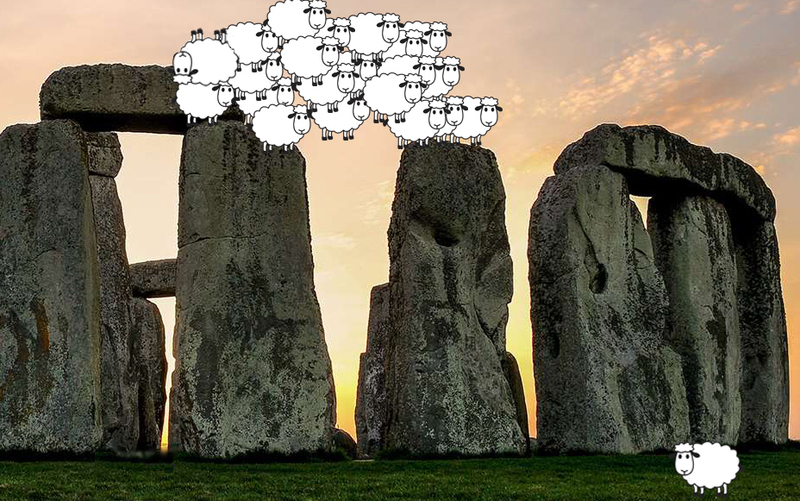 Once the cordons were lifted, we all went our respective ways. I was retired. One specific component to the pre-retirement discussions with my Head of Department involved an agreement to return for the Spring teaching term following my Autumn retirement date in order to teach a particular 24-lecture module. This would enable the Department more gradually to bring recently appointed early-career colleagues into play. I was content to do this; it was understood to be a one-off ad hoc arrangement with a specific and well-defined objective. Teaching undergraduate Physics students thereby ended completely a mere six months after I had retired. Defining an end to my former research endeavours is nowhere near as straightforward. Setting aside the glorious-but-hard-to-cope-with day, about seven months after the date of my formal retirement, on which many colleagues and friends came together in generous celebration of my career (here) there have been references to write for former members of my research team as they move from success to success, and continuing to act as a sounding board for those colleagues I was privileged to mentor. I’ve also had a sprinkling of other ad hoc tasks associated with my career-long support for the UK’s major research facilities. Rather more extensive has been the effort to realise my hope to see any significant residual hard-won data analysed, interpreted and submitted for publication. This is not only of intrinsic professional importance to me and my former team members but there is, in my opinion, an ethical need to make sure that the publicly-funded research we undertook is properly peer-reviewed and openly published insofar as we are able to do so. The difficulty, and at the same time, the pleasure, of trying to move forward on this is that it depends crucially on those research scientists with whom I undertook the experiments in the first place. It has been a delight to have seen four post-retirement journal papers emerge thus far, and to know that the fifth – and probably final – manuscript was accepted for publication just a few hours before this very post was uploaded. Interestingly, this final paper is both the longest in terms of pages of text and the oldest in terms of the date at which the data was gathered. It relates to a hugely ambitious experiment a colleague (Jacqui Cole) and I conducted in the USA which yielded a complex set of data on rare earth glasses in need of a novel and bespoke approach to its analysis. It has taken us more than a decade to complete the task, even with invaluable input from a couple of talented early-career researchers. Out of the results of our work I will also be able to present a paper at the annual conference of the Society of Glass Technology in September (abstract here). Will the taper in post-retirement research activity conclude at that point? I’m working on the basis that it will, but I have learnt to hold such conclusions lightly. 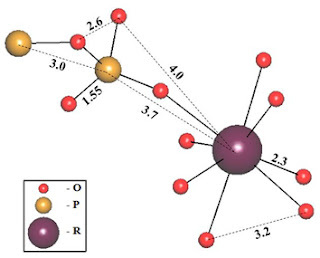 Heuristic diagram of the local atomic structure in a rare earth glass. There is a postscript: ‘freelance research’ has yielded some unexpectedly sweet fruit. I have had the opportunity, since I retired, of contributing in a small way towards the conservation of the stained glass at Canterbury Cathedral (see here) and of contributing to the study of star-forming regions in our galaxy (see here). I presented the glass conservation issues at a conference eighteen months ago, and a manuscript derived from the ‘citizen-science’ observational astronomy project has recently been submitted for publication. Science goes on, as it surely must. I am delighted to be a part of that process even now, albeit in an increasingly novel guise as time passes. I am also pleased to be able to confirm that new outlets for creativity, outside of the conventional boundaries of ‘science’, have readily emerged in order to enrich life. Back in time, when I was still a salaried academic, one of the students in the course on Matter I taught  managed to derive a novel form of creativity from my lectures. I habitually made audio recordings – later, video recordings – of my lectures available to students for revision purposes (and to help with dyslexia etc; see here and other related posts) but this one student found another use for them. He cut snippets from my lecture recordings and dubbed them onto a piece of music. I only found out about it after it had travelled, viral fashion, around the student body. I took it as a compliment, and still do. In order that you can enjoy this as well I've uploaded it to YouTube, here: it benefits from volume and decent bass . One of several things I learnt from his creativity is that I had, and most probably still have catch-phrases. There was one, however, that almost certainly led the pack in the context of this lecture course: “pick a scale” and its close variants. Why? Because the most common cause of needless mistakes within their numerical exercises was the admixture of measurement scales and a confusion regarding the units associated with a given scale. Thus, someone might mix grams with kilograms and be out by a factor of 1000 – make this mistake more than once in a calculation, or do so in the context of an equation in which the mass, for example, appears more than once, and the results will be thrown even wider off the mark. It was a problem that dogged the students in this programme more than most simply because they were often older than the usual direct-entry undergraduates and/or came from a wider range of educational backgrounds. Many of them had, like me, grown up with measurement scales and units that were commonly used before SI units, the système international d'unités, held sway as our metric framework. A ‘useful’ plastic ruler from my past: upper scale showing centimetres and their metric sub-division into millimetres; lower scales showing inches and subdivisions into tenths, twelfths and sixteenths. Within my own formal education I had begun with imperial units (miles, feet & inches; pounds, hundredweight and tons; hours; degrees Fahrenheit …) and all the derived units that went with them or alongside them – like foot-pounds to quantify energy and pounds per square inch as the unit of pressure. Many of us in the UK will still think in those terms on a day-to-day basis; many more in the USA will follow suit. I was versed in these things until my mid-teens; even the wicket on the cricket pitches my father and brother played on, and my son still does, are precisely one chain long (stumps to stumps; one chain = 22 yards = 66 feet). However, by then I was veering towards the sciences, and therefore also mathematics, and metrication became the thing – we were required to familiarise ourselves with the CGS system: centimetres, grams and seconds, and associated units like degrees centigrade. We were obliged to change yet again within two or three years. By then I was in the final stages of my secondary schooling – senior years of High School within the USA, approximately – and had opted to specialise solely in the physical sciences. (I specialised because that was what one did back then, and it remains the norm in England today unfortunately. By preference I would have added English Literature and either Archaeology, Logic/Philosophy to the mix.) This time it was a blessedly less radical move into the MKS system: metres, kilograms and seconds, and their associated units. The final change, or at least I hope and believe it’s the final one, came when I became an undergraduate Physics student: MKS moved almost effortlessly into the SI system, which retains the same base units of length, mass and time. 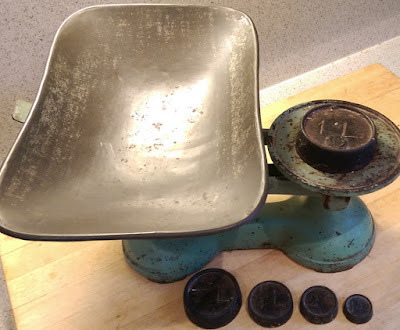 My wife still uses these imperial-scale scales in the kitchen, as do I when following classic old recipes – particularly for jam (or jelly for those in the USA). The mass currently on the scales is one pound (1 lb); the others shown are ½ lb, 4 ounces (4 oz, i.e. ¼ lb), 2 oz and 1oz. 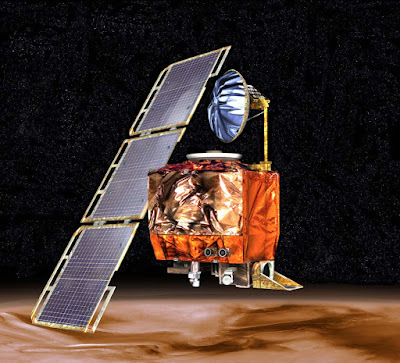 Lest anyone think this is an issue of minor irritation to a few early-years students, I’ll share with you the story of NASA’s $125M Mars Climate Orbiter from the late ‘90s. It burned up in the Martian atmosphere because engineers had failed to convert units from imperial to metric (see here). To bring it forward to today, just imagine the consequences of an analogous error in the software of a driverless vehicle. Scales and units are a non-trivial issue. Nothing in what I have said should be taken as a statement that the scales and units of former days were intrinsically inferior. I habitually use the metric system – almost always the SI – because it makes my life easier, both as a scientist and when in the kitchen or at my workbench, but these other scales have their strengths. Imperial scales are often quite intuitive for instance: a foot corresponds to just that – the average length of an adult foot, and an adult’s stride becomes a yard; the acre, a measure of area, was defined in terms of the farmland that might reasonably be ploughed in one day prior to mechanisation. The Fahrenheit scale, likewise, was established such that 0ºF corresponds to the lowest temperatures one might expect in Winter (- bearing in mind the parts of the globe in which the scale was being used) and 100ºF to the highest Summer temperatures to be expected. It’s all very sensible as far as it goes. Moreover, even now, and amongst a scientific community using SI units by default, there are ‘useful exceptions’. Astronomers and planetary scientists speak in terms of the astronomical unit, AU, for example, which is simply the average Sun-Earth distance; mass is often given in units of Earth’s mass or the Sun’s mass. Closer to home, although I perhaps ought to be employing the nanometre, nm, I still use a length called the Ångström when I’m discussing the separations between atoms: this was initially established as the diameter of a hydrogen atom – the smallest atom and therefore a useful ‘measuring stick’ in this realm. There are 10 Å in each nm. For a useful compilation of scales and units, old and new, see here. An obvious weakness in the historical scales, certainly as they were originally established, is that they could – and did – vary quite markedly from one community to another, much as the time of day varied within a country when all calibration derived from the Sun. Even after standardization was achieved there remained significant issues, not least with the English-speaking world. For instance, a gallon in the UK is not the same volume as a gallon in the USA: in fact it’s approximately 20% larger. However, these are well understood differences. More troublesome by far, to my mind at least, are those ad hoc scales/units invented ostensibly to help us understand something but which serve only to obfuscate and confuse. There is a depressingly long list of examples: measuring an area using a ‘football pitch’ as the unit, or a height in terms of Nelson’s Column in London, or a length in units of London buses, … My personal ‘favourite’, which I spotted in one of my grandsons’ books a few years ago, came from an author trying to convey the mass of one of the monoliths which make up Stonehenge by informing us that is was the same as 22 sheep! I can’t help but think that these inventions are counter-productive. I was teaching this within our Foundation Year programme which I helped to start back in the early ‘90s. The programme, inserted before the more conventional undergraduate degree programme, has offered a ‘second chance’ to hundreds of students in the succeeding years. I loved teaching within it, and the students I met whilst doing it. It’s amusing to see that the lead text at the top of the current web page still has its roots in what I wrote for printed course booklets back then: this Physics evidently ages well. The music is Tractor Beam by Eat Static, which is used with their kind permission; the image is of Bulkhead by Rick Kirby and this stands outside the Marlowe Theatre, Canterbury, UK. By profession I'm into the physical sciences, with interests in teaching physics and using a range of approaches to study glass as a material. I'm also committed to public engagement: sharing my love of science with non-specialist audiences. Copyright R.J. Newport (date as originally posted). Picture Window theme. Powered by Blogger.